Chicago area resellers and their customers who want to take a look at the future of digital signage will have that opportunity on March 8, 2018 when Stampede takes the Samsung Demo Room to the Lincolnshire, IL as part of its 2018 Big Book of AV Tour and Conference Series. The daylong event will be held at the Lincolnshire Marriott Resort from 9:00 a.m. to 2:00 p.m. Attendee registration is now open here. Headlining the tour stop is The Samsung Experience Demo Room, which is designed to ask the question we all ask each and every day: What does the future look like? Guided tours will begin at 10:00 a.m. and will occur every 30 minutes for the duration of the event. The day will also feature a series of on-site presentations that include: “Overview of the Drone/UAS Industry and Business Potential,” and “Drone Video Systems: A New AV Category for a New Age of Opportunities,” both of which will be led by dean of the School of Flight Training at Unmanned Vehicle University, Paul Dragos. Additional presentations include: NEC's "10 Steps to a Successful Video Wall,” Samsung's "All-in-One e-Board Solutions,” “Understanding the Benefits of 4L Projection" by Optoma, and “Video Wall Solutions" from Leyard and Planar. Each event includes an information-rich schedule of exhibits, training sessions, product introductions, and networking opportunities. 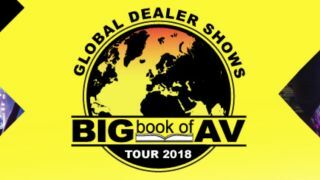 Every attendee of the 2017 Big Book of AV Tour & Conference Series will receive a $500 Stampede credit, a $50 American Express gift card, and will be entered into a drawing for the chance to win a free DJI Drone.